Hey guys! I'm home from sunny Florida! Did you miss me? Just kidding, I know you did. I have been crazy busy ever since my plane touched down though, because my university convocation was this week! I am an official graduate. However my univeristy career is far from over... It's back to the grind right away to hopefully get accepted into a masters program. I think I'd stay in school forever if I could, just to delay full adulthood. 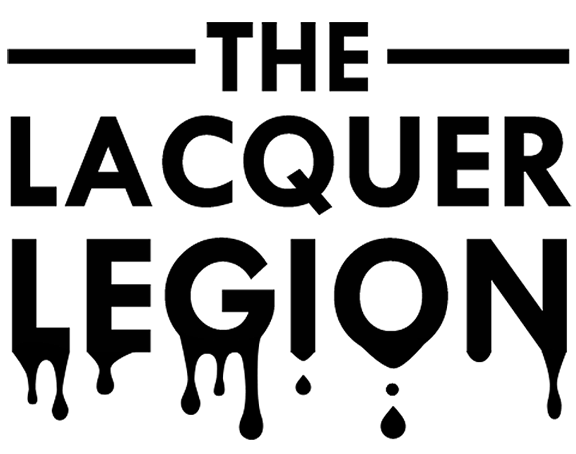 I scrambled just now to put a post together for this month's Lacquer Legion prompt, because I don't wanna miss a month! The theme is Garden, so we could all take inspiration from our lovely spring blossoms for this month's post... Except Newfoundland did not get that memo and we have no spring and certainly no gardens. The temperature is practically below freezing. I came home from Florida for this?! See what I meant by simple? Ha! Despite how easy this look is to complete, I think the pink flowers look really cute on the off-white and the green adds a springy pop. The bone-colored background is OPI - My Vampire is Buff. The green? Essie - The More The Merrier. The pink is a go-to fave, China Glaze - Dance Baby. And the yellow, Essence - Sun Dancer. I hope you guys liked this easy yet cute mani! And don't forget to share yours if you haven't already on our Facebook page, or anywhere on social media with the tag #LLgarden. Ready for an old swatch that was hidden away, waiting for its time to shine? The polishes were all pretty similar though, which is why I don't think their popularity had much lasting power. I see them in blog sales a lot lately. But looking back at this one makes me want to bust them out again! What can I say? I'm a glitteraholic. Yo. Just found another random purple OPI swatch not unlike my last post! Lighter this time. Yes, OPI, I do lilac it. Very much. This is once again a very popular OPI polish and a lot of people have this one in their stash. However, I only got it pretty recently. Actually I think I got this one and Funky Dunkey together at Winners... Random purple score? Anyway, you can see that I wasn't being careful with the application and there are some patchy areas but I bet that two coats would be perfect if you were paying more attention. Ha! Hi! While searching for some things to schedule for this month, I found a random swatch of a cult-favorite OPI polish that I picked up somewhat recently. I have no idea what took me so long to get it! This is a straight up purple creme. Perfect OPI formula, and such a fun color. This is one of those OPI shades that everyone should have in their arsenal! I can't remember wearing this, though... I must not have had it on for long! I will need to try it again soon. Dat purple tho! Hey everyone! In just a few short hours I am leaving for DISNEY WORLD! Things will be quiet around here (as usual lately... haha) but I do have a few things scheduled so that it isn't just silent. I'll no doubt be posting a lot on Instagram and maybe if the mood strikes I will even tweet. Who knows! Now, la pièce de resistance... Vacation nails!! I knew that putting on purple and teal and animal print would give me the best chance at not getting sick of it. So I used two of my favorite colors from my favorite gel line! To do a gradient with the gel polish, you simply paint half the nail with one color and the other half with the next, and use a small (clean) brush to mix the two where they meet. It may not look the best on the first coat, but the second coat really brings it together and smooths it out. I added the zebra AND leopard stamp from Konad m78 for maximum animal print. Ha! Yooooo. Today I'm sharing some polishes I know y'all have definitely seen before, but they're too darn cute not to share. Blue and purple make blurple and that's just what this polish is filled with. I love the two colors and I really wanna wear this over a nice light pink for an even cuter mani! I love how two pieces overlapped on my middle finger and actually created a piece of blurple. Ha! I do wish the glitter was more dense in this one though, I did two coats for this coverage and that included some foolin' around. This is not a perfect representation of Freckles because the blue and purples are mostly from the underlying Blurple, but you get the gist! Again I would have preferred the glitter to be a bit more dense to allow for less coats and better drying time. Maybe I should invent a glitter strainer. Put it over the top of the bottle and pour out some of the base but leave the glitter! Hahaha. That would be so helpful, right? With sooooo many polishes. More glitter always. Here's a shocker. I only bought ONE polish from the OPI Brazil collection. I've noticed a trend recently at my local pro store that with collections like Brazil that consist of a lot of cremes, they don't really get bought up quickly. And usually will end up on the $2 clearance rack. Sooo... I might do some damage then. But for now, only one needed to come home with me! This gorgeous green has a perfect formula and really pretty shimmer which helps bring the color to life. I love greens. Can't help myself. Now please excuse me while I go bake a single serve cookie for my lunch. Maturity at its finest. This month's haul is a week late because I simply couldn't remember what I had bought! April was a really busy month for me, thus there wasn't much polish buying. I did pick up these two from a blog sale and now I am only 2 polishes short of having all the Halo Hues. Grabbed a few polishes for $1 at Shoppers! And a cute lippy. Essence - I Got A Crush On Blue! I'm preeeeeetty sure that's it! 13!